Dr. Bruno Danis of the Royal Belgian Institute of Natural Sciences talked with SciencePoles about the approximately 700 new marine species that have been found in the depths (from 700 m up to 6.3 km) of the Weddell and Scotia Seas off Antarctica during the three ANDEEP marine research expeditions that took place between 2002 and 2005. Dr. Danis took part in the third and most recent of the Antarctic benthic deep-sea biodiversity (ANDEEP) expeditions and will be in charge of the access to biodiversity data that has been taken from all three expeditions. He is the Project Manager of SCAR-MarBIN (Scientific Committee on Antarctic Research Marine Biodiversity Information Network). Is there anything noteworthy about the discovery of about 700 new species at the bottom of the Weddell and Scotia Seas? The most important finding is the very high level of biodiversity we've discovered. That's the main finding of the research. For most of the taxonomical groups we worked on, we've found large numbers of species totally new to science. For some groups, we've even discovered some new taxonomical families. Each taxonomical group displayed a variable, but always significant, proportion of new species. For example, if you consider only the isopods we sampled, almost 600 species are new to science. Many scientists had previously believed that the ocean floor of the Weddell and Scotia Seas had been lifeless until the findings of the ANDEEP project. Why? I guess it's mainly because the regions we were looking at had been drastically under-sampled. Until the ANDEEP project, there had never been any major sampling efforts in the region, apart from occasional Russian and American expeditions. The ANDEEP expeditions have brought entirely new insight regarding this issue, because results have show that the actual picture is contrary to what is traditionally believed regarding the relationship between biodiversity and depth. People usually think that the deeper you go, the less biodiversity you find. This is actually not the case. Even if the abundance in the deep Weddell Sea is lower compared to the shelf, there is a considerable level of diversity, especially if you take the sampling efforts of the ANDEEP expeditions into account, which is small compared to expeditions that have focused on the continental shelf in Antarctica. As the Weddell and Scotia Seas are places of deepwater formation in Earth's system of oceanic currents, were you able to glean any information regarding the evolutionary processes of the species inhabiting this region of the ocean and how these species are related to other species living in other regions of the planet's oceans? This is a very complex topic. 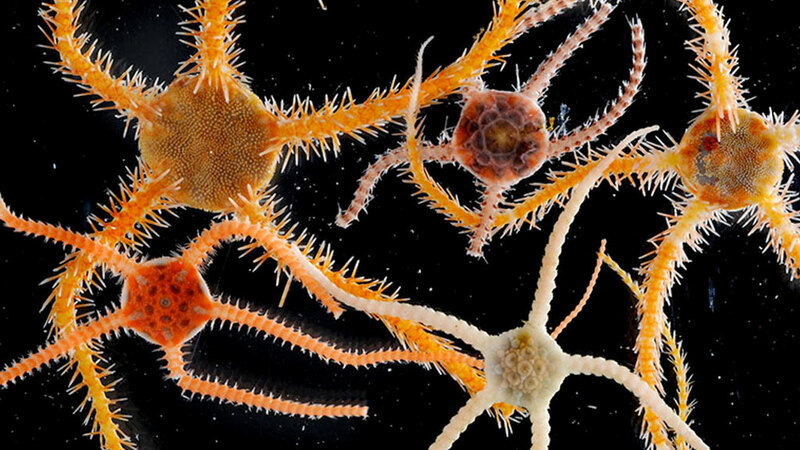 We can't get a simple picture of the evolution of these animals, and a simple explanation won't fit all groups of organisms living in the Weddell and Scotia Seas. We found that some communities, for example, have a composition similar to other deep-sea communities, while we would find the opposite in other groups. This suggests the origin of the species we sampled during ANDEEP is a complex combination between the deep sea and the Antarctic continental shelf. But it's a very complex picture we're getting, and this research is just an insight. How does the speciation process (the process by which new species evovle) in the Weddell and Scotia Seas differ from comparable regions of the ocean? The deep Southern Ocean is unique as it is a stable system with regard to the environmental conditions the fauna lives in. The organisms living there are highly adapted to living in these conditions. It is clear that these organisms have their origins in warmer waters, but they have been challenged by strong environmental stresses such as the advance and retreat of the shelf between glacial and interglacial cycles. This means that these organisms have been pushed by the ice towards the bottom of the sea, so only species that are able to cope with greater barometric pressure have been able to survive. This is a very important driver for Antarctic species, and was actually corroborated by ANDEEP data. Another characteristic of the Southern Ocean is the fact that the continental slope surrounding Antarctica is much deeper than the continental slope in other ocean systems around other continents, allowing easier exchange between the continental shelf and the deep sea. These are two examples of the main speciation drivers in this region. How does the deep ocean ecosystem in the Weddell and Scotia Sea compare with other deep ocean ecosystems elsewhere in the world? Scientific interest in the deep ocean ecosystems has really started in the last three decades. Little is known about the the deepser areas of the Southern Ocean. This ecosystem is relatively new in a geological sense compared to other deep ocean ecosystems elsewhere on the planet. For example, the western side of the Weddell Sea was formed during the opening of the Drake Passage and tectonic movements in the Scotia Sea some 34 million years ago. From an oceanographic point of view, an important driver is the presence of the cold Weddell Sea bottom water, which is the main water mass above the organisms living on the floor of the Weddell Sea. Deeper analyses of the results will allow for comparison between deep Southern Ocean and other deep oceans. Have there been any other research expeditions taking samples of other areas of Earth's oceans at similar depths? To my knowledge, there are a few long-term projects focusing on sites in the deep North Atlantic and Pacific Oceans, and are moving into process-orientated investigations. There is a dedicated initiative under the Census of Marine Life (COML), the Census of the Diversity of the Abyssal Marine Life (CEDAMAR) (which specifically addresses the issues of deep-sea biodiversity), and similar work is going on in other ocean basins around the world at even greater depths. How do you go about sharing your findings with the rest of the global scientific community? The initiative I am coordinating is called SCAR-MarBIN (SCAR-Marine Biodiversity Information Network). SCAR-MarBIN is a core International Polar Year project, and acts as the information component of another Census of Marine Life project, the Census of Antarctic Marine Life (CAML). SCAR-MarBIN is a collaborative, voluntary and federating project, initiated under the aegis of SCAR, and funded primarily by the Belgian Science Policy (BELSPO). The idea is to allow for open and free access to the taxonomic and biogeographic data, meaning users are able to consult Antarctic marine biodiversity information at a single access point on the web. Users are free to search, browse and visualise the data, and can even download it in a variety of formats. SCAR-MarBIN has developed a centralised Register of Antarctic Marine Species (RAMS), which holds information on almost 7,000 species, and is constantly updated by a board of specialists. We also invest a lot of effort in following the international standards for data and metadata exchange, so we are able to share with wider biodiversity initiatives such as the OBIS (Ocean Biogeographic Information System) and the GBIF (Global Biodiversity Information Facility). The SCAR-MarBIN web portal has gathered more than 100,000 visitors since its creation, and gives access to more than 500,000 distribution records from almost 50 distributed databases. Bruno Danis is a marine biologist from the Royal Belgian Institute of Natural Sciences who has spent a large part of his professional career working on biodiversity databases. Since 2005, he has been working on SCAR-MarBIN – the Scientific Committee on Antarctic Research (SCAR) Marine Biodiversity Information Network – a database to keep track of marine life and biodiversity in Antarctica.